Cozy cabin for two with furnished patio - close to the village and the lake! 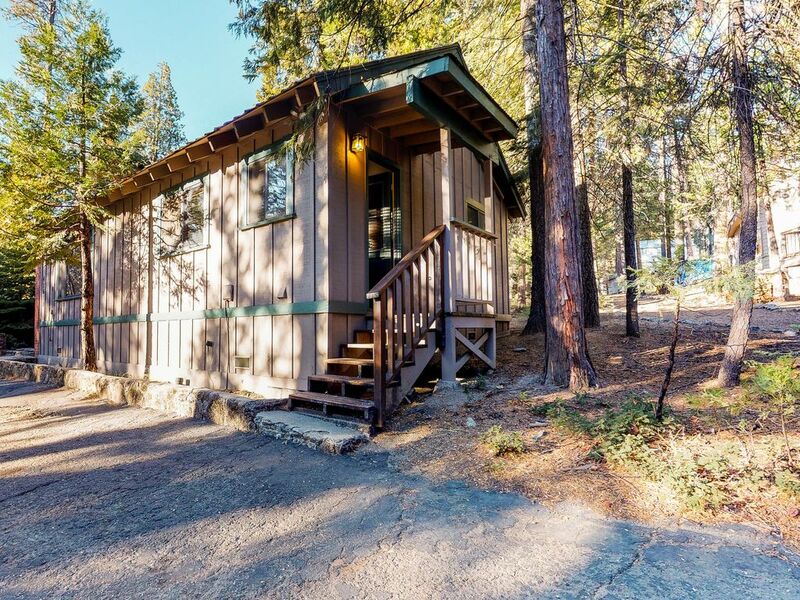 Recently remodeled, this charming, one-bedroom cabin features a full kitchen, wood-burning fireplace, furnished patio, and space for just the two of you. Whether you're visiting to have fun on the lake or to hit the slopes at China Peak, this vacation rental is ideal for your next romantic escape. Take a stroll into the heart of the village for local shops and restaurants offering everything from hearty breakfasts to fresh coffee to sit-down dinners. You'll also find sporting goods stores, antique shops, and a full-service market all within a short walk of your retreat. If you're visiting during the summer months, head to Shaver Lake for watersports, fishing, and hiking trails, only a couple miles away. And when the snow is falling, pack up your 4x4 vehicle and drive just 20 miles northeast to hit the slopes at China Peak. This home comes with free WiFi and two flatscreen TVs equipped with Dish Network. A DVD player is also provided if you want to bring a few discs and catch up on some movies. The full kitchen comes with everything you might need to whip up anything from a quick snack to a romantic dinner. And during the summer months, you can fire up the gas grill outside and have a cookout. Take a break from the summer heat or plan a ski-cation for two at this charming cabin in the woods. Parking Notes: Two spaces available in the parking lot in front of the home. No parking on the street during winter months due to snow removal. No recreational vehicles or camping allowed in yards and driveways. Boat & Trailer Parking: Allowed only in West Village & East Village. We recommend to all guests to utilize Sierra Marina for a wet slip and/or trailer parking. We had a GREAT stay and love it! Such a cute little cottage! Walked in to a very clean, open and warm house with the perfect amount of space for 2 people to stay and relax comfortably. Highly recommend!!! Thank you. I loved the location and the house. The shower was pretty small, but otherwise a wonderful stay. The cabin was very clean, very well supplied with everything you need. Everything was perfect in the cabin. It was quiet and very well equipped for a comfortable stay. The only downside was the shower head which was up very high. Overall it was wonderful... And I would stay there again. It was also very quiet and peaceful.